My dear sweetie pie, my precious daughter, has told me some weeks ago that she wanted to cut her hair short. This was the conversation we had one night, while we were lying on the bed. 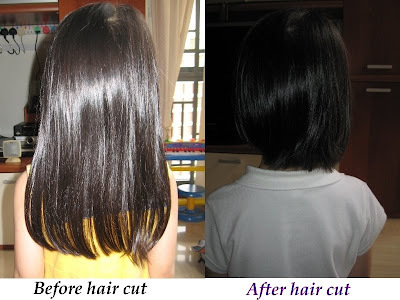 Sweetie: "Mummy, when my front hair (fringe) is long, when you want to cut, I want to cut my hair short." She pointed to below her ear. Mummy (surprised): "Why? I thought you have always love your long hair?" Sweetie: "Ya, but I want to cut so that I don't have to tie my hair when I go to school." Mummy (persistently): "But why? Did someone tell you to cut your hair short?? But I love your long hair." Sweetie: "No, I want to cut it myself." Mummy (still didn't give up): "How about cut it till your shoulder, at least you can still pin up both sides?" Pointing to her shoulder. Sweetie (nodding her head on her pillow): "Okay." After this conversation, I kept prompting and hinting her that she should not cut her hair. However, it seems that her decision was final! She went around telling my helper and her grandparents that she wanted to cut her hair till shoulder length. Gee...it's not easy to change her decision. Finally, last afternoon, when I saw that her fringe was long, and was due to cut, I snipped off her long hair too! As I'm not a pro stylist, of course the hair length didn't turn out too straight. It was slightly slanted from left to right at the back. However, she refused to let me trim further. She said she like it this way. She's got style!! Hahaha... My sweetie has grown up! By the way, she was really patient, sitting there to let me cut her hair. She didn't move a bit, while I was struggling to trim the bits of hair straight...straight...but still, it wasn't straight!